As soon as I sense the evenings closing in, I get a powerful urge to seek out a cosy corner in an old pub and settle down for the autumn nights to come. 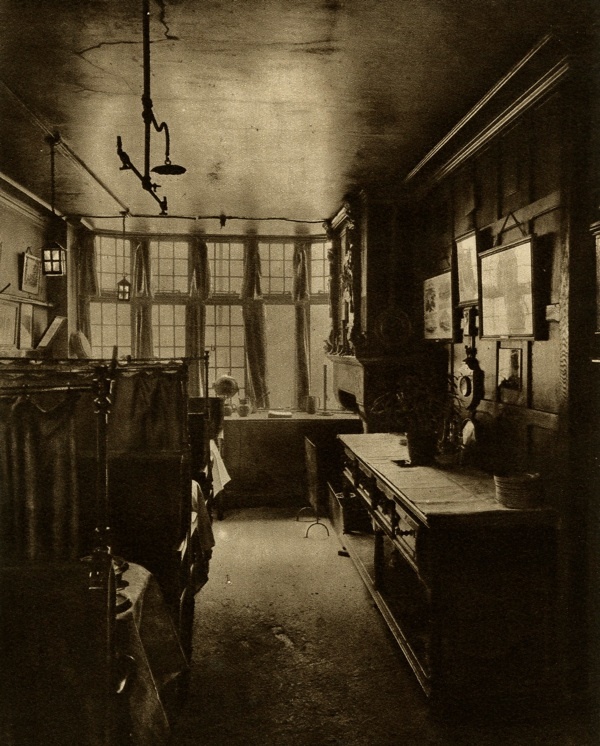 There are plenty of attractive options to choose from in this selection from the popular magazine Wonderful London edited by St John Adcock and produced by The Fleetway House in the nineteen-twenties. 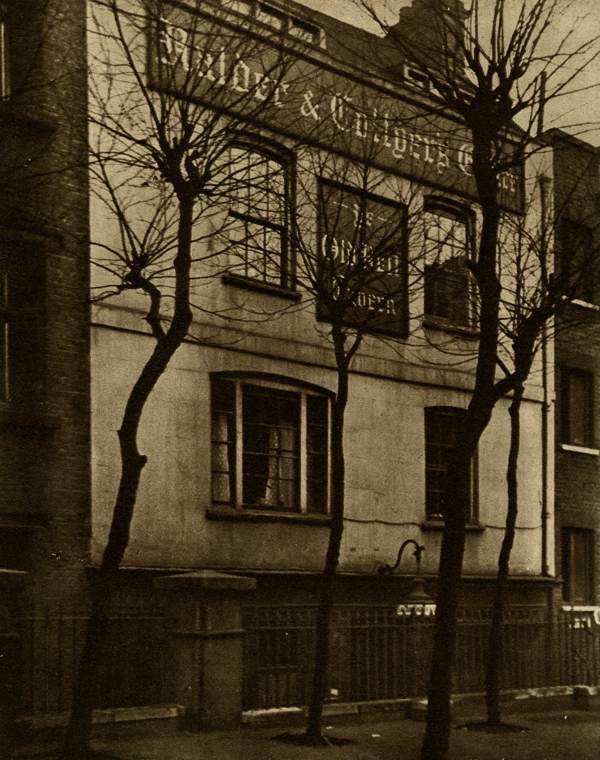 The Old Axe in Three Nuns Court off Aldermanbury. It was once much larger and folk journeying to Chester, Liverpool and the North used to gather here for the stage coach. 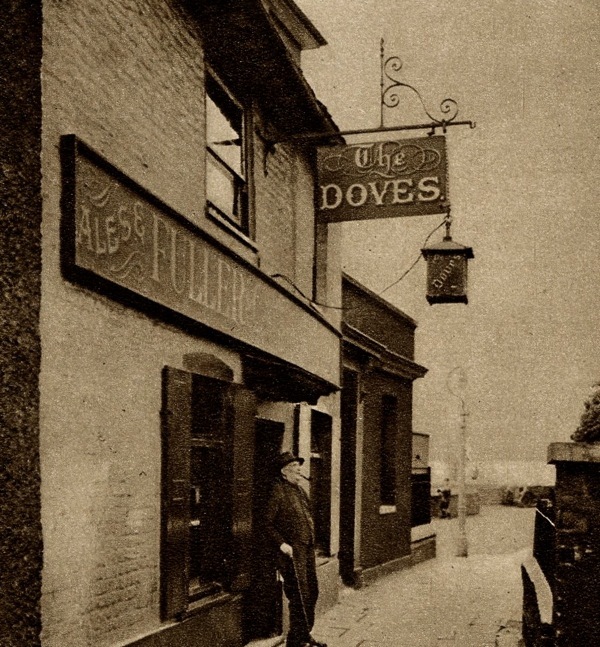 The Doves, Upper Mall, Chiswick. 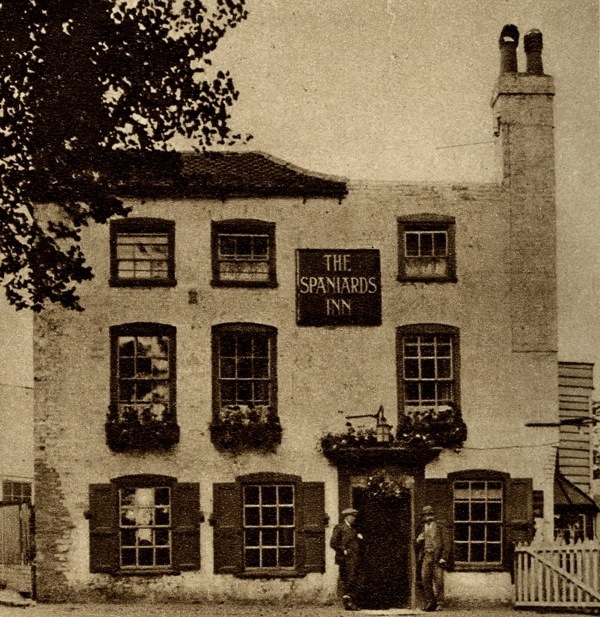 The Crown & Sceptre, Greenwich – once a popular resort for boating parties from London, of merry silk-clad gallants and lovely ladies who in the summer evenings came down the river between fields of fragrant hay and wide desolate marshes to breathe the country air at Greenwich. At the Flask, Highgate, labourers from the surrounding farms still drink the good ale, as their forerunners did a century ago. 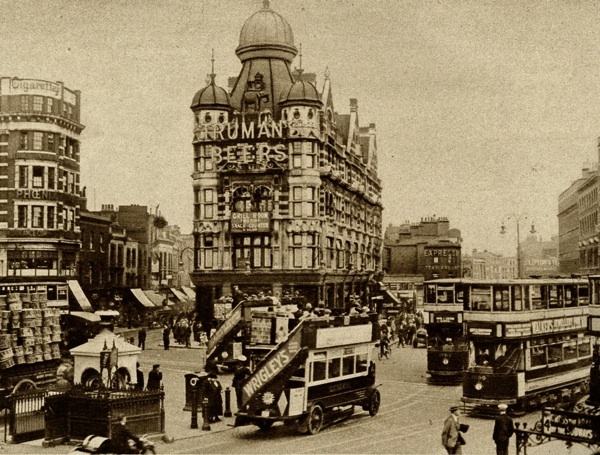 Elephant & Castle – The public house was once a coaching inn but it is so enlarged as to become unrecognisable. 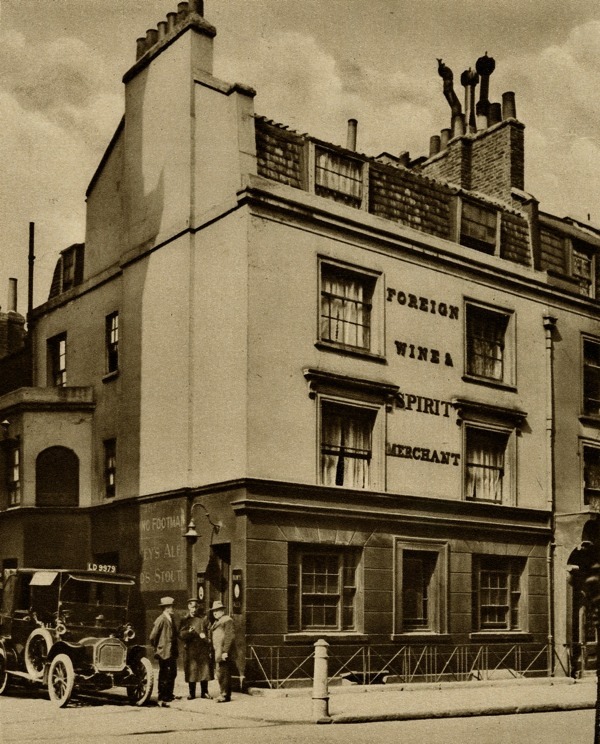 The Running Footman, off Berkeley Sq, is named after that servant whose duty it was to run before the crawling old family coach, help it out of ruts, warn toll-keepers and clear the way generally. He wore a livery and carried a cane. The last to employ a running footman is said to have been ‘Old Q,’ the Duke of Queensberry who died in 1810. 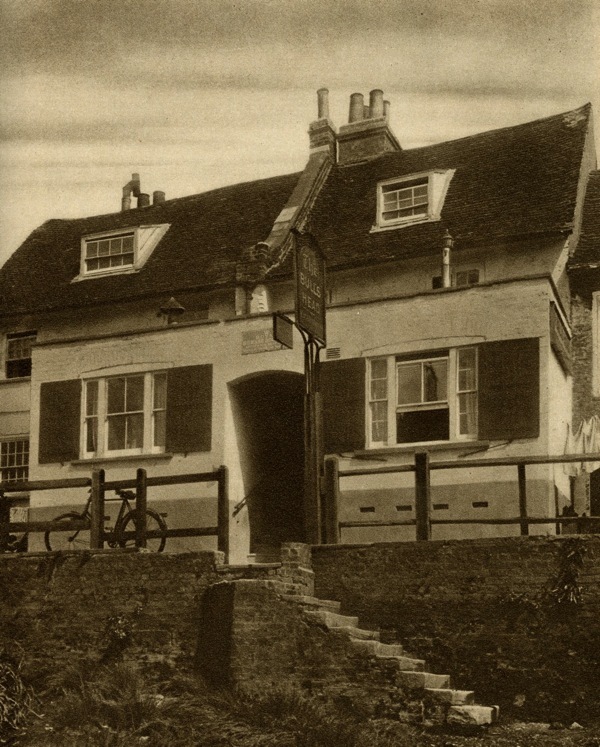 The Grenadier in Wilton Mews, where coachmen drink no more but, at any moment – it would seem – an ostler with a striped waistcoat and straw in mouth might kick open the door and walk out the place. 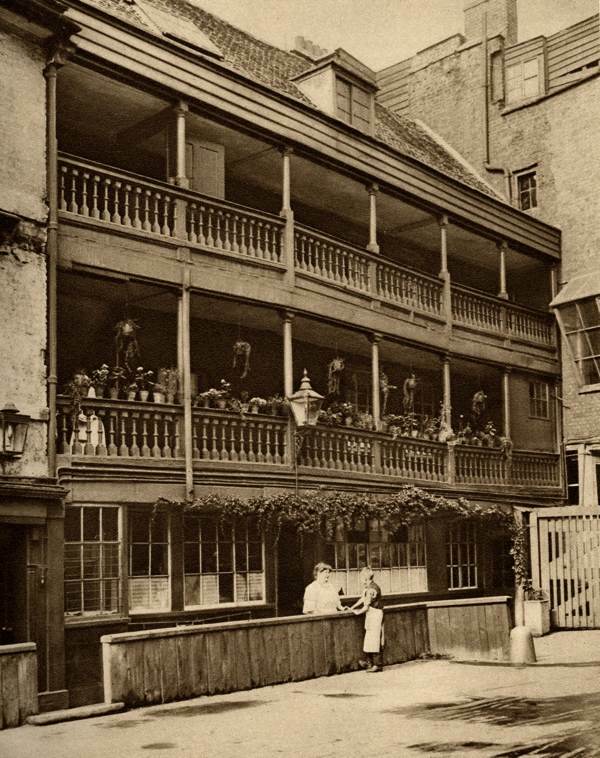 The Bull’s Head at Strand on the Green is an old tavern probably built in the sixteenth century. There is a tradition that Oliver Cromwell, while campaigning in the neighbourhood, held a council of war here. 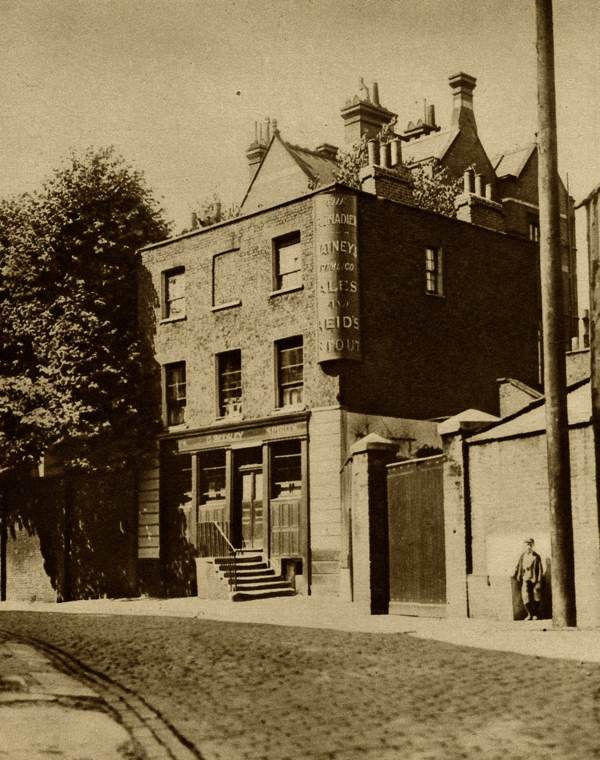 Old Dr Butler’s Head, established in Mason’s Avenue in 1616. The great Dr Butler invented a special beer and established a number of taverns for selling it, but this is the last to bear his name. 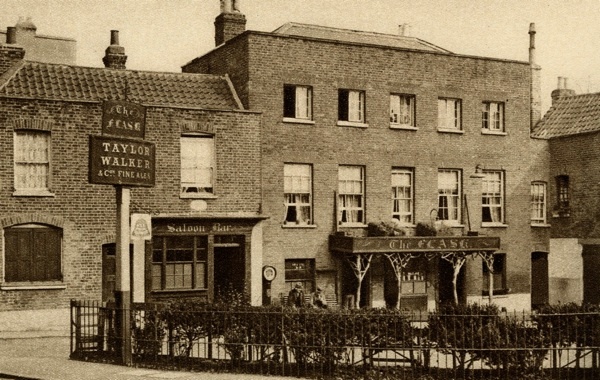 The Two Brewers at Perry Hill between Catford Bridge and Lower Sydenham – an old hedge tavern built three hundred years ago, the sign shows two brewer’s men sitting under a tree. 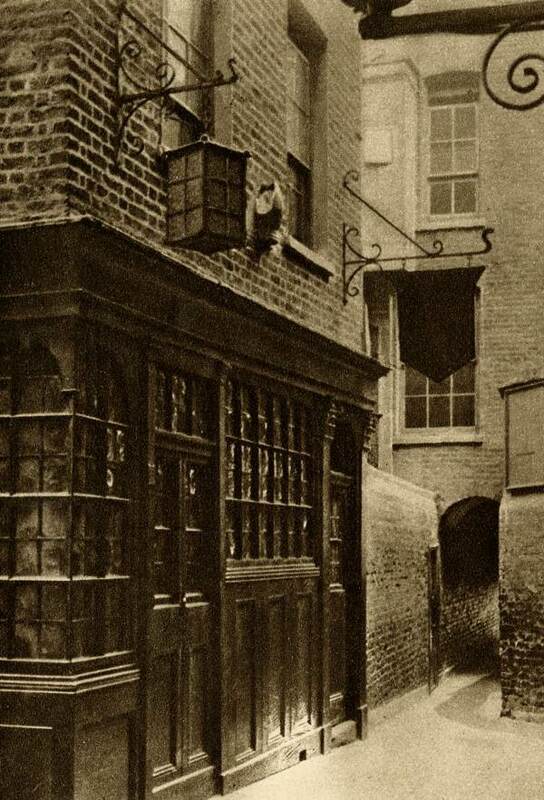 The Old Bell Tavern in St Bride’s Churchyard, put up while Wren was rebuilding St Bride’s which he completed in 1680. There is a fine staircase of unpolished oak. 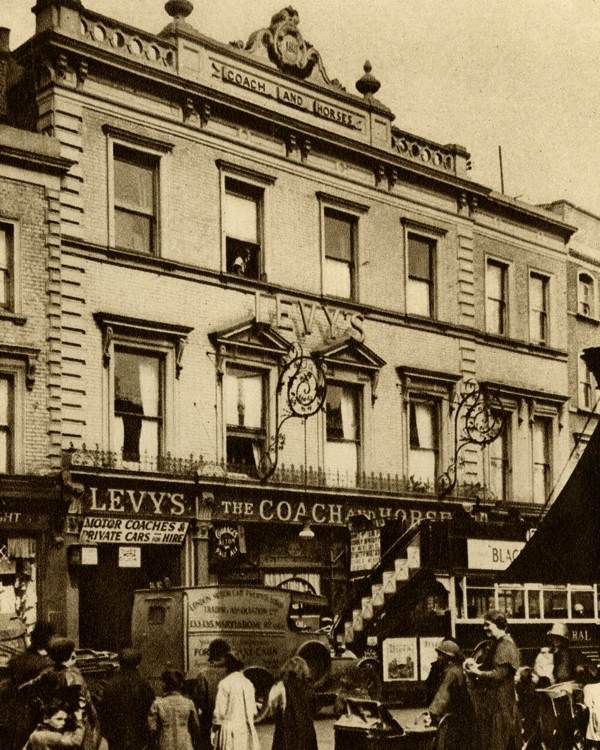 Coach & Horses, Notting Hill Gate. This was once a well-known old coaching inn, but it still carries on the tradition with the motor coaches. The Anchor at Bankside. With its shuttered window and projecting upper storey, it enhances its riverside setting with a sense of history. 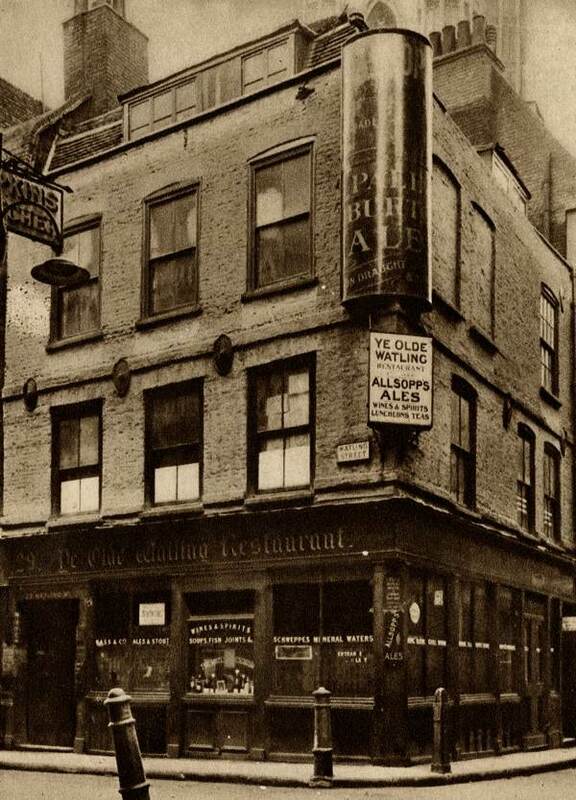 The George on Borough High St – one of the oldest roads in Britain, for there was a bridge hereabouts when Roman Legionaries and merchants with long lines of pack mules took the Great High Road to Dover. 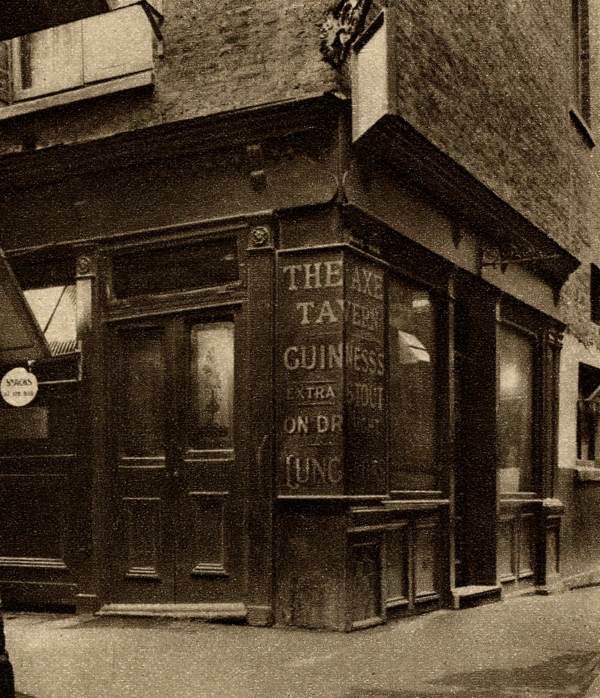 The Mitre Tavern, between Hatton Garden and Ely Place. It bears a stone mitre carved on the front with the date 1546. Ely Place still has its own Watchman who closes the gates a ten o’clock and cries the hours through the night. 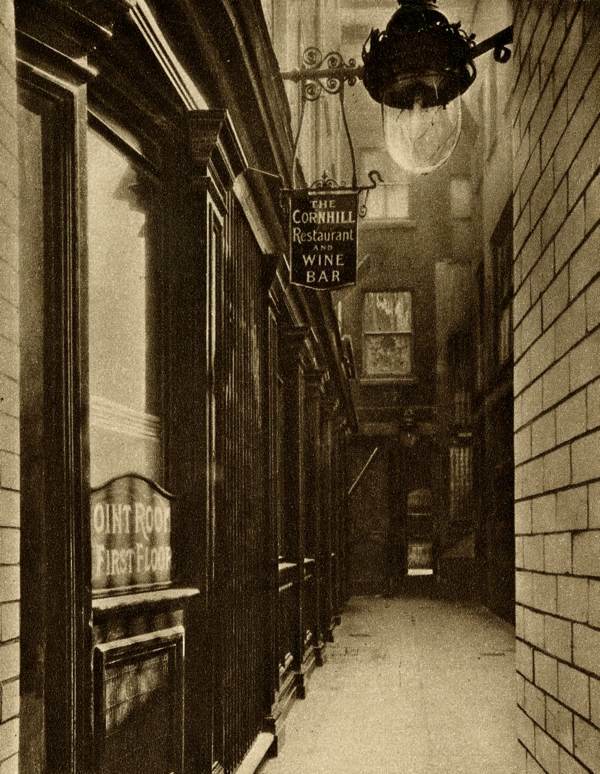 The George & Vulture is in a court off Cornhill that is celebrated as the place where coffee was first introduced to Britain in 1652 by a Turkish merchant, who returned from Smyrna with a Ragusan boy who made coffee for him every morning. 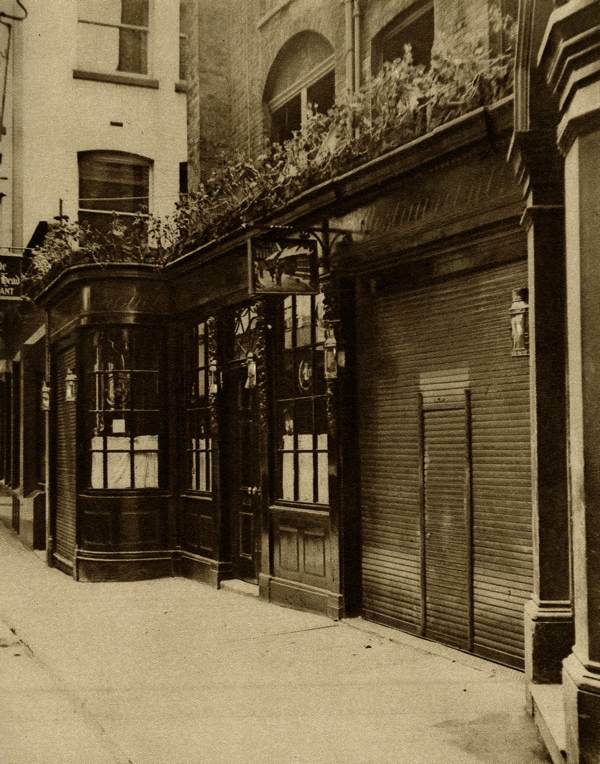 The Bird in Hand, in Conduit between Long Acre and Floral St, formerly a street of coach-makers but now of motorcar salesmen. The Old Watling is the oldest house in the ward of Cordwainer, standing as it did when rebuilt after the Fire, in 1673. 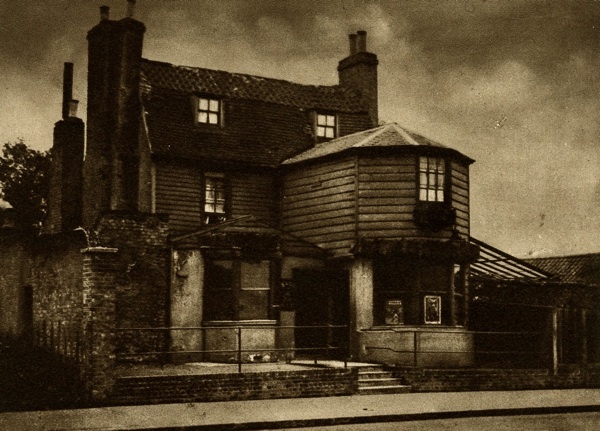 The Ship Inn at Greenwich got its reputation from courtiers on their way to and from Greenwich Palace and in 1634 some of the Lancashire Witches were confined her, but now it is famous for its Whitebait dinners. 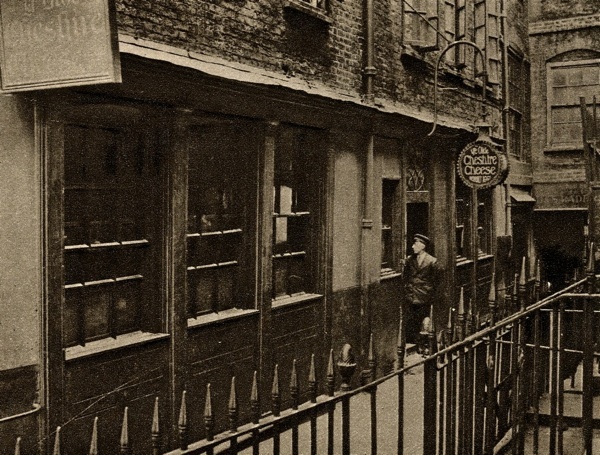 The Olde Cheshire Cheese – the Pudding Season here starts in October. 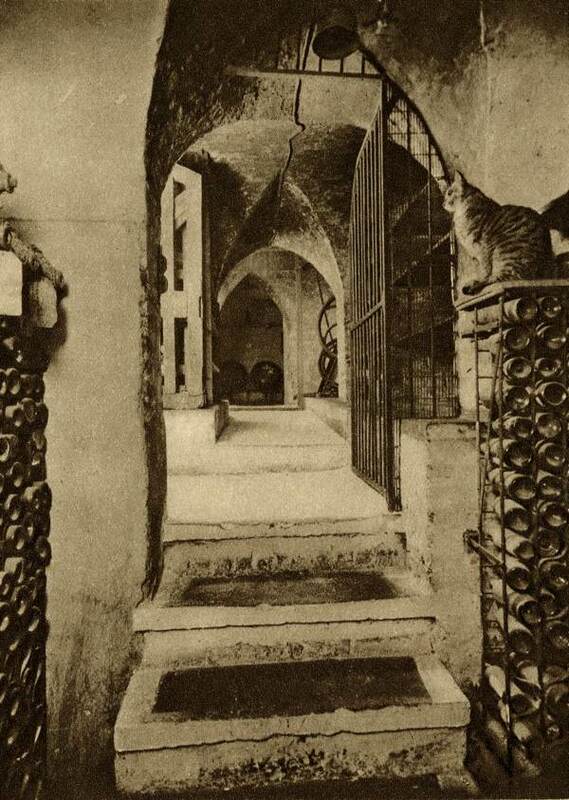 The Cellar Cat guards the vintage at the Old Cheshire Cheese. Almost under Fleet St is a well, now unused, but pure and always full from some unknown source. To raise the iron trap door which keeps the secret and to light a match and stoop down over this profound hole and watch the small light flickering uncertainly over the black water is to leave modern London and go back to history. I almost expected to see this when I started reading this post, but sadly it wasn’t there. I used to see this rhyme when going to a Mecca Restaurant for my lunch, I was too young to drink back then. These words were carved into the stone pavement, outside an old pub I suppose, as you can see I’ve never forgotten the rhyme but the name of the watering hole I never did know, I’ve often wondered and I thought that this time you had the answer for me. methinks I shall die never knowing, I can’t even recall the name of the lane; it was pretty much opposite Gt St Helens in Bishopsgate. 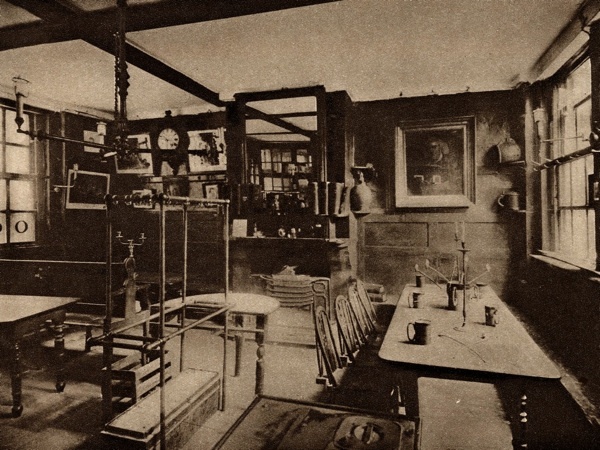 Wonderful London is your ancestor Gentle Author! Wow, what great photos and information. Another pub crawl on the cards?? I’ve drunk in several, & know of one or two others. Wonderful photos, thanks for showing these. Fabulous pictures. 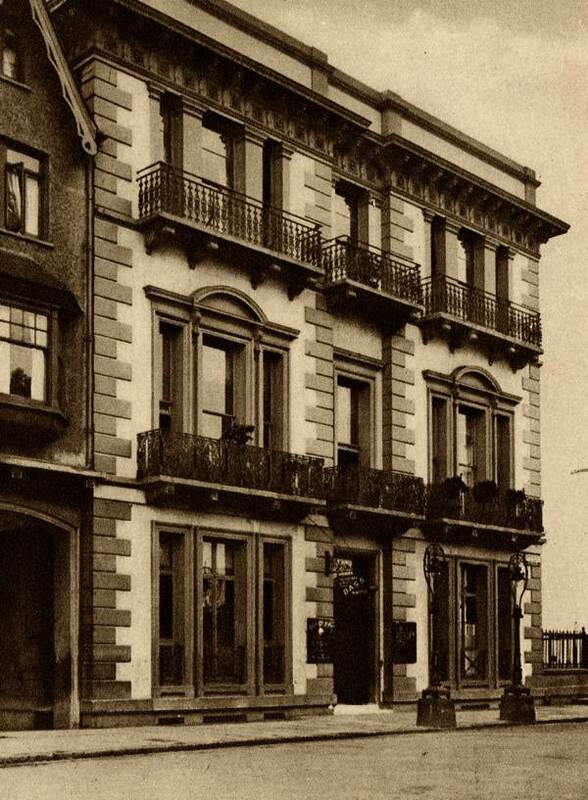 The Dove is next door to the school I went to – I know it well and it is still recognisable from the exterior shot. It’s strange it is said to be at Chiswick when it is most definitely in Hammersmith with a great view over the suspension bridge that everybody knows from the Boat Race. Thank You for these Wonderful Photographs. Your site never fails to delight. 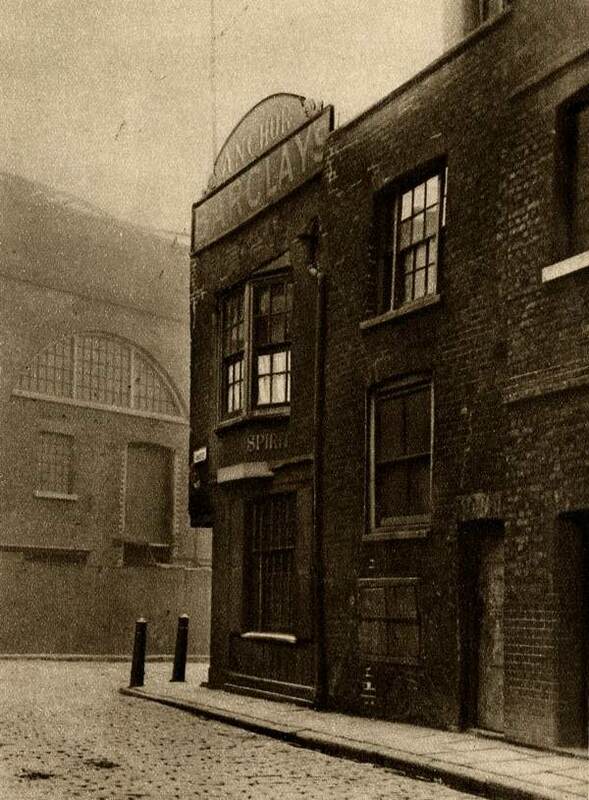 Could anyone tell me the name of the pub which is right next to the Hawksmoor Church in Spitalfields?Margart Mc. Wonderful to see the Bull’s Head. 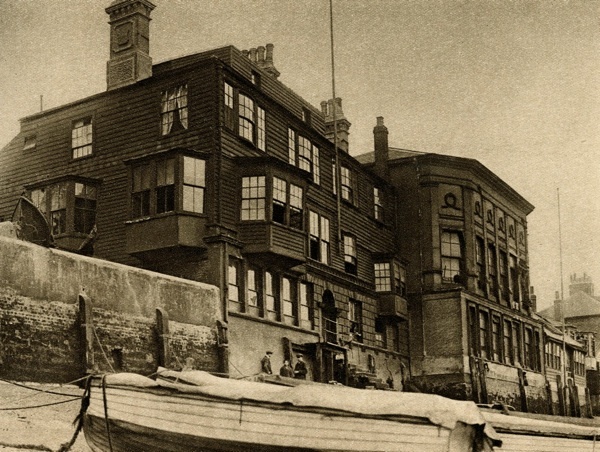 My Dad was born and raised at Strand On The Green and most of his family lived in the cluster of streets off Thames Road, immediately adjacent to the pub. It was a true local and my Grandad’s favourite; in fact, my Dad only recently told me that, knowing he was dying in the late 1960s, Grandad would spend endless hours with his brother in law on the towpath by the pub – and doubtless managed a few libations along the way. Halcion days. My Great Gran is Alice Cakebread, her family run The Golden Heart for years apparently. I’ve been looking into my ancestry, amazing what you find out. 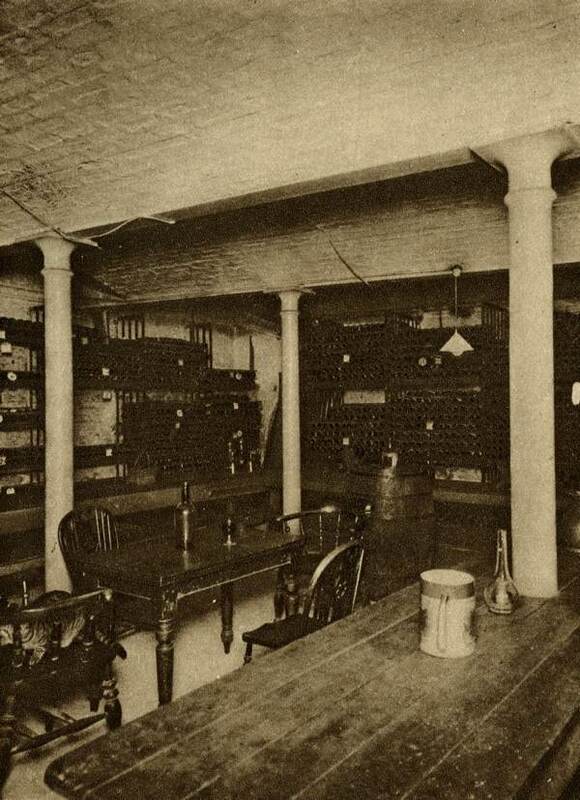 Anyone out there that knows about the Cakebread family please get in touch. 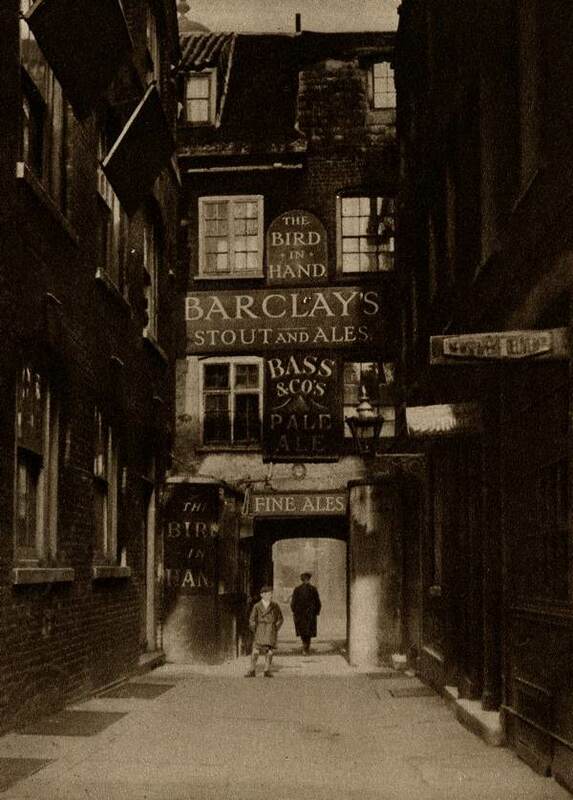 Will be visiting Spitalfields and visiting this amazing pub very soon. Great photos! from Rebecca in Somerset.